CHICAGO – The Chicago Sky announced today the team has re-signed guard Allie Quigley. Per team policy, terms of the deal were not disclosed. A two-time WNBA All-Star (2017, 2018) and two-time WNBA Sixth Woman of the Year (2014, 2015), Quigley enters her 11th season in the league and seventh with the Chicago Sky. 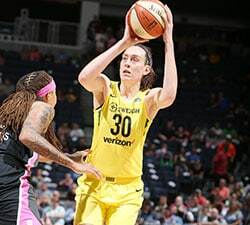 Last season, Quigley made history when she walked away back-to-back champion of the WNBA All-Star Game’s Three-Point Contest, setting a new all-time record for most points scored in the competition across both the NBA and WNBA. Quigley started in 32 games for the Sky in 2018, averaging 15.4 points, 2.4 rebounds, and 2.4 assists, while shooting 85.7 percent from the free-throw line and contributing 29.7 minutes per game. A Joliet native, Quigley was originally drafted out of DePaul University by the Seattle Storm in the second round of 2008 WNBA Draft, before being waived shortly after. 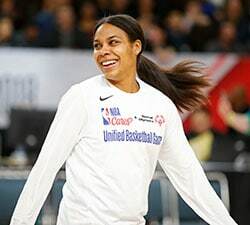 From 2009 to 2011, the 5-foot-10 guard made short-lived appearances on the rosters of the Phoenix Mercury, Indiana Fever, San Antonio Stars, and the Seattle Storm once more, but never played more than 10 minutes per game in her first six WNBA seasons. Quigley joined the Chicago Sky in 2013 to return to her hometown, and quickly became one of the team’s top performers. In 2015, she became the second player in history to be named the WNBA Sixth Woman of the Year in consecutive years (2014, 2015) after her performance helped lead the Sky to the team’s second-best record in franchise history. In 2017, Quigley became a full-time starter Chicago. Her remarkable career trajectory made her a candidate for the WNBA’s Most Improved Player award that same year. 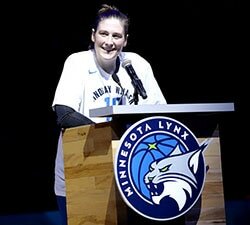 Chicago tips off its 2018 campaign on Saturday, May 25 in Minneapolis against the four-time WNBA champion Minnesota Lynx. The Sky will host the defending WNBA champion Seattle Storm for opening night at Wintrust Arena on Saturday, June 1 at 7:00 p.m. Fans can purchase tickets by calling (866) SKY-WNBA or by visiting sky.wnba.com/tickets.